Hammonds Wood Flooring has designed and completed close to 6,000 floors since our inception in 1982. The company is owned an operated by the Hammonds family and adheres to a strict family code of ethics. Certified by the National Wood Flooring Association and is the only company in South Texas with the wood flooring inspector certification. Our portfolio is impressive... Our own designers and specialty team's work together to create a unique landscape for your home. Our wood boutique touts such elements as custom inlays and designs, full color pallet staining and striking borders that create atmosphere in your living spaces. For something truly unique ask about on-site hand scraping and fabrication which brings a one of a kind flavor to that special place in your home. As one of our preferred clients your will also have access to our expert repair and refinishing teams. Additionally, Hammonds Wood Floors has begun to offer finishing products that have a low impact on the environment such as neo-natural finishes. 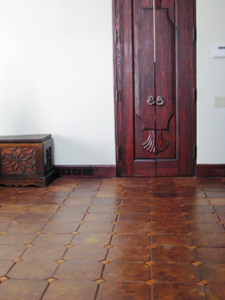 Prefinished flooring alternatives are also available to offset environmental concerns. Hammonds is Solid (and not just our floors)... Our company holds its place as the trusted solution to flooring design and fulfillment in South Texas because of the solid commitment to upholding the family name. Our clients include the King Ranch, the La Cantera, Incarnate Word Colleges, Sea World, McNay Art Museum, Club Giraud and many more. "Our word is our bond" and is what drives us to conduct business fairly and honestly taking every advantage to over deliver and impress our high profile commercial customers as well as those customers who trust us with their homes. As a boutique hardwood dealer we carry virtually all wood types and species and have experience in the installation and care of those products. 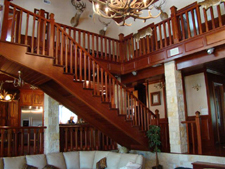 From prefinished or engineered planks to reclaimed wood "We cover all that!" National committee for employer support of the National Guard Reserve - Patriotic Employer Award (2006). 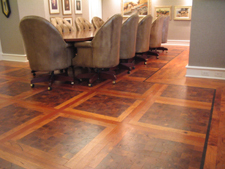 National Wood Floors Association (Member Since 1996) Certified Wood Flooring Inspector Awarded (1996) Holder: Marty Hammonds Lyda Inc. National Award of Merit - Commercial over $25 million category (1994). San Antonio Metropolitan and Surrounding Areas San Marcos, New Braunfels, Spring Branch, Boerne and all of lower South Texas!